Miss Singh: WAKING UP IN BOSTON! I was in New York for the past two weeks and while I was on holiday, I decided to take a short road trip to Boston! Apparently, I have heard that Boston is beautiful during Christmas time and because it’s only a few hours away from New York, I thought why not! I had never been to Boston before, but now I can see what the hype is all about. It’s gorgeous! The architecture, the food, the shopping is all just amazing and perfect for a weekend getaway from a big city! It still has a city feel but much smaller and more relaxed. Here are a few pictures from the trip! 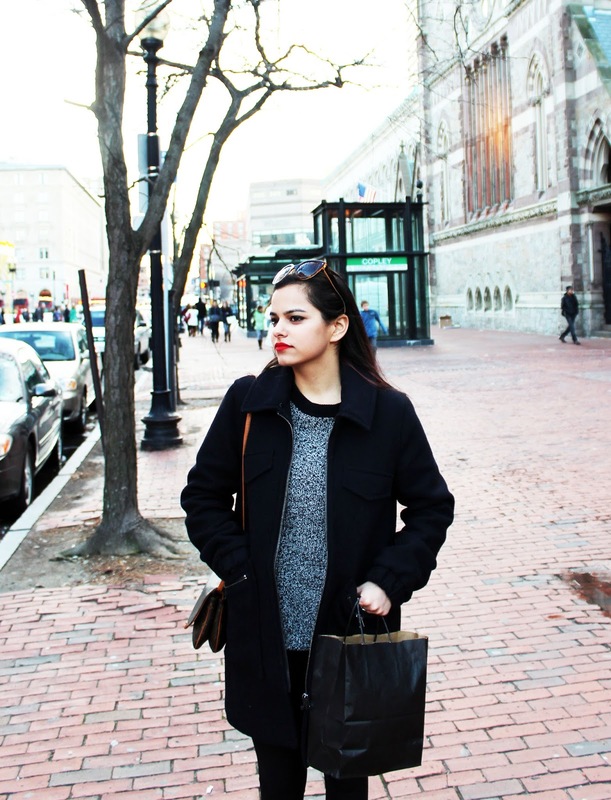 Newbury street: Food, shopping, bars and so much more! The Cafeteria: Great burgers and fun drinks. Sonsie Restaurant: Delicious brunch and bloody mary's! Newbury Comics: If you’re a comic person, check this out! Mija Cantina and Tequila Bar: Get your margaritas and tacos on! Abe and Louis: The steak and salads are amazing!Also their seven layer chocolate cake is heaven! Frost Ice bar: A bar that is made of ice, literally! A fun experience! Atlantic Fish Co.: Get the seafood platter! Boston Public Library: Just a beautiful place to appreciate architecture and history. Faneuil Hall: Christmas trees, food, shopping and more fun! I highly recommend these places! I was there for two nights so I couldn't see as much as I wanted to but it was a fun getaway and I love Boston! I can't wait to go back and spend more time there. Have any of you been to Boston? I hope you enjoyed this waking up in post. Thank you for reading! You can also follow me on my social media! Dang, it looks like you had quite a fulfilling trip. Seven layer cake sounds so delicious. Haha! It was a great trip! :) Thanks for reading! I am so glad you love the series! :) Thanks so much for reading and following!